Stephen Curry is going to miss at least two weeks after rolling his ankle. 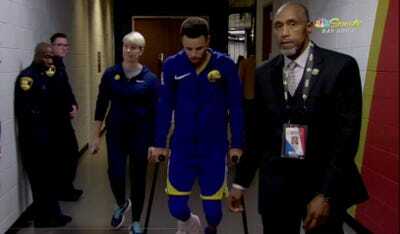 Curry injured the ankle on Monday night when he stepped on the foot of an opponent. It is safe to assume the Golden State Warriors will be extra-cautious with Curry considering his history with ankle injuries. Stephen Curry is going to miss at least a couple of weeks after rolling his ankle in a scary-looking injury during Monday night’s game. A league source told Adrian Wojnarowski of ESPN that Curry will be re-evaluated “in a couple of weeks.” That timeline suggests Curry would be out at least two weeks and possibly much longer. Curry rolled his ankle when he accidentally stepped on the foot of E’Twaun Moore of the New Orleans Pelicans. It is safe to assume that the Golden State Warriors will err on the side of being super-cautious with Curry considering his history of ankle injuries. If so, the NBA’s marquee Christmas Day matchup between the Warriors and the Cleveland Cavaliers could be without one of the NBA’s biggest stars.